Jyoti (Jeneane Prevatt, PhD) is one of the founders of Kayumari, a spiritual healing community located in the Sierra foothills of California, the redwoods of the Black Mountain Preserve Retreat Center between Jenner and Cazadero, California, and in New York, Switzerland, Prague, and the Amazon. She is the spiritual director of the Center for Sacred Studies, a church dedicated to protecting and sustaining the spiritual practices of first-nation peoples around the world as they join their hearts in a prayer for world peace. From that effort, the International Council of Thirteen Indigenous Grandmothers has evolved. Jyoti is an internationally renowned spiritual adviser and psychological consultant. Her background includes education in cross-cultural spiritual practices, social services program development, training at the Jung Institute in Switzerland, and extensive international travel. 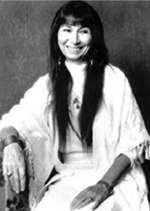 She has devoted her life to bringing unity to the planet by facilitating the development of alliances between individuals who are the guardians of indigenous culture and traditional medicine ways.